Hello everyone, we are really doing great with the unpacking and things are getting pretty around here. Curtains are going to be my next step. Many rods to purchase and Country Curtains is always my go to store. I love all of the items she sells in her Etsy shop, I hope you take a moment to pay a visit, and I am going to plan a purchase soon. She sent me this and I am so excited. It was like Christmas and will be special to me. She has been following my blog since the beginning and I love seeing her creativity and beautiful décor. 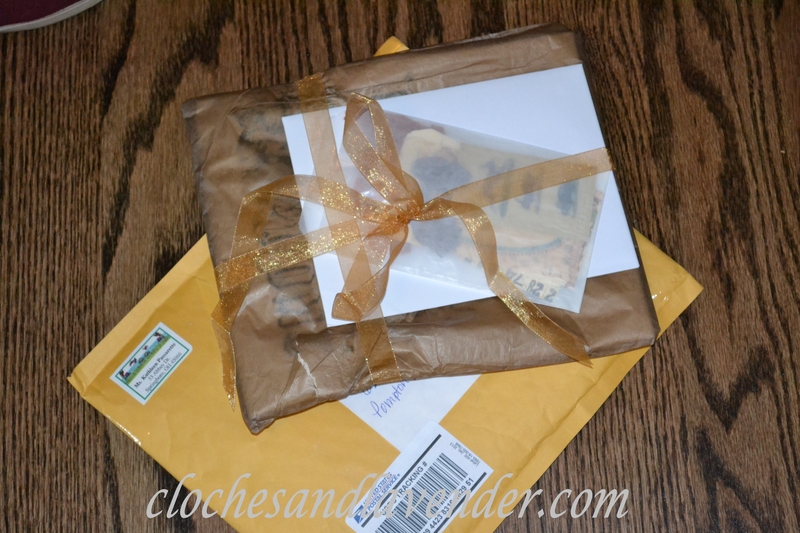 Kathy, thank you so much for thinking of me and these gorgeous gifts, which by the way, the packaging was so pretty as you can see. You are a dear friend. I LOVE blogland and all of the women I have created wonderful friendships with over the passed two years. Kathy is such a great blogger and person. I have a few of her beautiful towels and love them. She is so sweet and what a nice gift to send to you. Lovely house warming gift. The friends we meet in blog land are amazing and so special. They are so amazing, yourself included. I love all of her items in her shop. I am hoping to get a Christmas or fall pillow this year. Kathy is so talented! She is also a sweet and thoughtful person and blogger! I met her at Haven year before last and she is precious! What a lovely surprise, Cindy! I’m so excited for you that you are in your new home! You’re right, I have met so many wonderful friends in Blogland that are so special! Thanks so much Betsy. It is great to be here and things are really get pretty!!! I have so many of you that are such great friends. You are so very welcome, Cindy! I just had to send you something for your new home knowing how long you’ve waited and how excited you are. What a wonderful surprise!!! And I’m sure it will be right at home in your lovely new home!!! What a very lovely gift from Kathy! She is so sweet! Kathy is such a sweet person…what a nice gift and sweet surprise! How very sweet! So exciting for you. the packing is the hardest part. Take your time though because I did NOT, and I am still cleaning out cabinets lol. Very thoughtful and such a nice surprise for you. The fun has been happening. Still have touches to finish up. Bloggers are incredibly kind women, aren’t they? What a beautiful housewarming gift Cindy ! Kathy is a sweetie and how very thoughtful for her to send you such a great housewarming present!! !…yes, fellow bloggers are the best! I adore her and she has such great stuff. How sweet that Cathy sent you such a lovely gift! 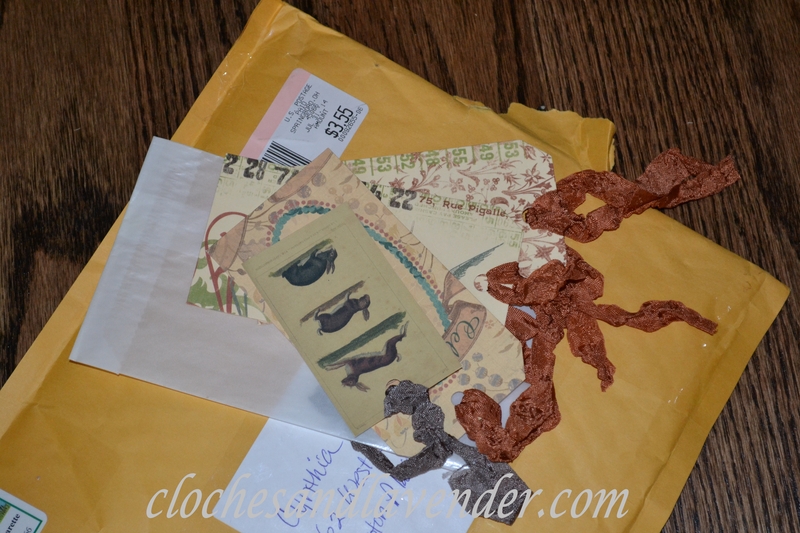 It’s always wonderful to get presents, but when they’re such thoughtful presents from a blog friend, it’s even more so. When all is said and done, and the walls are painted and the flooring installed and everyone oohhs and ahhs, what really matters is knowing there are some truly wonderful people out there! That’s what makes blogging so special. Things are moving along and getting pretty. I can’t wait to share. Curtains still need to be hung and some finishing touches. I just got all caught up on posts since your medallion painting one. I’m tired now…. I have to get my stuff fixed, put sliders on my furniture so it doesn’t scratch the floor ever again, fire off additional letters to a cleaning company and the movers who pissed me off, hang my pretty new towel, and worst of all I can’t even sleep there tonight. Oh and I changed my name back to the one I’m comfortable with and have boxes to unpack and curtains to order. I’ll do all that after a nap. Thanks so much Laura, things are really coming along. A furniture repair man is coming Sunday to repair the pieces that got damaged. The moving company is sending him, so things are looking up. I must say I am so happy here and LOVE our home. Can’t wait to share! What a delightful surprise and so pretty too! Can’t wait to see all the progress you have made with your new home. Things are really coming together and we are so happy here. So much pressure is off of me. I can really get around this house. That was such a nice thing to receive! I’m happy to hear that you’ve moved in. I bet this is an exciting time. It is and I am having a great time decorating and coming up with ideas. I can’t believe how much I love our home! What fun to receive those lovely housewarming gifts! I am so glad you are pleased with your new home. Everything’s an adventure, and I hope it continues to be a happy one. How sweet! Kathy is so super talented and such a nice person! 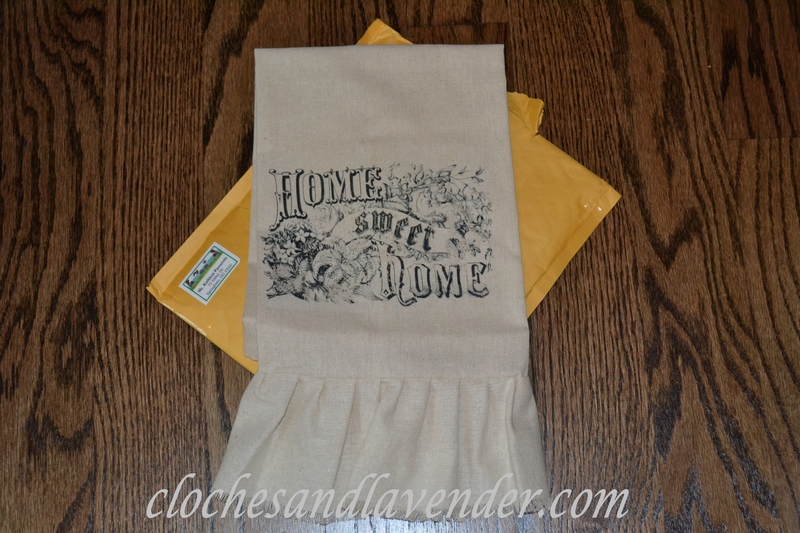 What a sweet little hand towel and the perfect addition to your new kitchen! Kathy is so sweet!